Finding out you’re pre-diabetic can definitely be a wake-up call. Then you find out that you have to purchase life insurance? You’re probably thinking, “I’ll never get good rates with my current health!” Not so fast. If you only shop with one company, chances are you won’t find a very good rate. However, if you take our tips and shop with an independent agent, you’ll most likely still get a pretty good rate. 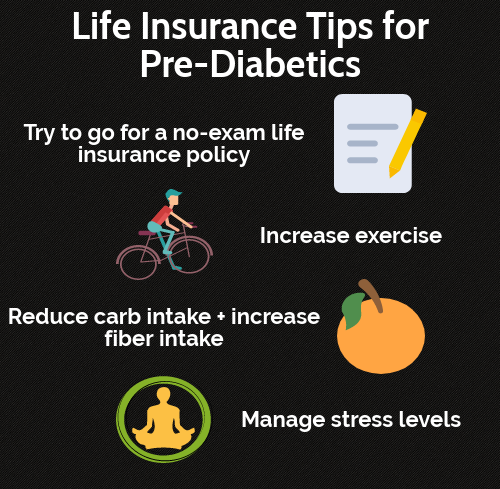 In this article, we discuss what being a pre-diabetic entails, and what steps you can take to get affordable life insurance rates. 5. Have Questions? We Can Help! With pre-diabetes, many people don’t even show any symptoms. According to Mayo Clinic, pre-diabetes means that your blood sugar level is higher than normal, but not yet high enough to be classified as type 2 diabetes. What classifies as “normal” blood sugar (also known as blood glucose) levels? They vary throughout the day, but normal fasting blood sugars should be under 100 mg/dl, before-meal sugars are 70-99 mg/dl, and “postprandial” sugars should be under 140 mg/dl. When levels become higher than normal, it causes inflammation in your blood vessels and nerves (which isn’t good). So if your levels are slightly above these, you could be on the way to developing type 2 diabetes. Most estimates in the report do not differentiate between type 1 and 2 diabetes, but because type 2 accounts for 90-95% of all diabetes cases, this data is most likely representing type 2 diabetes. If you have already been diagnosed with diabetes, read this article to learn what to expect when applying for life insurance. Since classifying someone as “pre-diabetic” doesn’t have very clear guidelines, life insurance companies prefer to classify someone as either “not diabetic” or “diabetic”.What does this mean for those who get categorized as diabetic? What are the questions that an underwriter will ask to conclude if you are diabetic or not in their books? Has your doctor ever prescribed you any medication to control your blood sugar? What were your blood sugar levels when you completed your life insurance medical exam? If they’re above 145, you’ll most likely be classified as a diabetic. What were your A1C levels when you completed your life insurance medical exam? If your A1C is over 7.0, you’ll most likely be classified as a diabetic. Keep in mind that just because you’re deemed diabetic by a life insurance company, that does not mean the same thing as being diagnosed diabetic by a doctor. Remember that it is easier for underwriters to classify you as one or the other, so it’s best to consult with your doctor on a regular basis. For instance, your blood sugar and A1C levels may be elevated and classified as “diabetic” by an underwriter, but could be good news to your doctor, especially if they’re lower than they were on your previous physical! The reason life insurance companies must be more conservative when it comes to underwriting is due to the fact that they must assess your risk factor that will be held accountable for the next 20-40 years. In short, it’s not you, it’s them! Lucky for you, you may still have a way to get lower premiums – opting for a no medical exam life insurance policy. With a “no med” policy, you are not required to undergo a medical exam to qualify for a policy. If you haven’t been officially diagnosed by a doctor with diabetes and can safely steer the health questions so the company does not ask for a medical exam, you could save yourself quite a bit in premiums. Ah, the dreaded word – “exercise”. Regular exercise can not only help you lose weight, but it can help you increase your insulin sensitivity. When you exercise, it helps your muscles to use blood sugar for energy and muscle contraction. Exercise also doesn’t have to mean running on a treadmill for hours at a time. The beauty of it is that it can be whatever you want it to be! Love to dance? Zumba is a great workout. Maybe you love the water – swimming is a fantastic way to work out. Other beneficial ways of working out include: weightlifting, biking, walking, running, sprinting, hiking, high intensity interval training (HIIT), calisthenics, etc. Another word that gets a bad rap. When people hear the word “diet”, they assume it means eating very little, and solely consuming salads (or some other unsatisfying food). However, diet is just another word for how you eat! When you are at risk for developing diabetes, or have diabetes, it is important to lower your carbohydrate intake, and increase your fiber intake. Your body breaks down carbs into sugars – primarily glucose – and then the insulin moves the sugars into your cells. If your insulin isn’t functioning properly, this causes your blood glucose levels to rise. Reducing your carbs can decrease the amount of blood sugar spikes, therefore reducing blood sugar levels. In conjunction with this, increasing your fiber intake will slow down the digestion of carbs and absorption of sugar, creating a more gradual blood sugar rise rather than a huge spike. There are two types of fiber: insoluble and soluble. Both can be helpful, but soluble fiber specifically has been seen to reduce blood sugar levels. 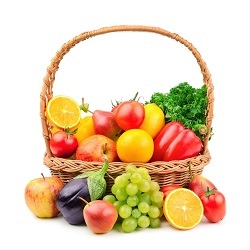 Great sources of fiber include vegetables, fruits (just watch the carb content on some of them), whole grains, and legumes. The RDA recommends about 25 grams/day for adult women and about 38 grams/day for adult men. Along with diet, water consumption is very important! Not only does it prevent dehydration, but it can help your kidneys flush out excess blood sugar through your urine. Stress is never good for your body in general, but did you know it can actually affect your blood sugar levels? When you’re stressed, your body produces hormones called cortisol and glucagon. Both affect your blood sugar levels by causing them to rise. So making sure you tend to your mind and keep your stress levels down is crucial. Two great ways to reduce stress are through exercise or meditation.